Sun, sand and juice! Click here to play! You're in paradise, running a juice bar and there's been a rush of customers during the hot summer days. See if you can spin in the right ingredients to keep the customer's happy and bring in the big wins! All of the customers seem to want bananas in their Tropical Punch, so you'll want to spin in plenty of these symbols. Spin three of them across line three and bring in a massive 6000 credits! 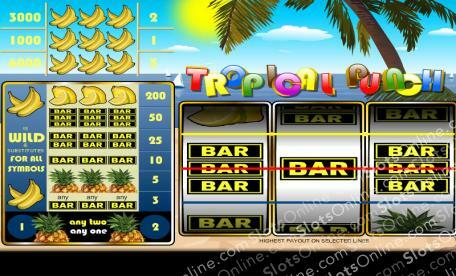 Three bananas across line two gets 3000 credits, and three across line one will get 1000 credits. Garnish your tropical smoothies with a little bit of lemon. Spin three of these sour citruses across any active pay line and you'll get 200 credits. Pineapples will also help you satisfy the crows, bringing in 5 credits. Triple, double and single BARS will also help collect customer cash. Have plenty of fun in paradise collecting fruit and you could see your Tropical Punch paying off with massive wins. The bananas act as wilds. They will substitute for all other symbols to help you spin in more wins.